My last article was a look at the effects of pitch location on batted balls. While it ended with on somewhat disappointing note, showing that the results couldn’t really be applied to individual pitchers, it did make me think more about which components of a pitch affect the pitch, and in which ways. Before we get right to the graphs, a quick note about my methodology. I grouped each pitch from 2009 onward — which is the year PITCHf/x started to record spin rate consistently — into buckets based on spin rate (pitches were rounded to the nearest 50 RPM) and pitch type (I included four-seam fastballs, curveballs, changeups, two-seam fastballs, cutters, knuckleballs, and sliders). I then found a multitude of stats for each bucket: contact rate, average speed, average movement, ground ball rate, and many more. I also did the same with spin angle, grouping pitches into buckets by rounding to the nearest 20 degrees, but the results weren’t particularly meaningful. I also combined two-seam fastballs and sinkers when I was doing this. There has been some discussion in the past about whether there is a difference between those two pitches. While PITCHf/x classifies them separately, they are more or less indistinguishable, and when I first did this without combining them, they overlapped on nearly all of the various graphs. So now for the graphs, which are all embiggenable — to quote a certain, long-running animated program — by clicking. (Actually, they’re all emhugenable; clicking on them will bring you to a very zoomed-in version.) 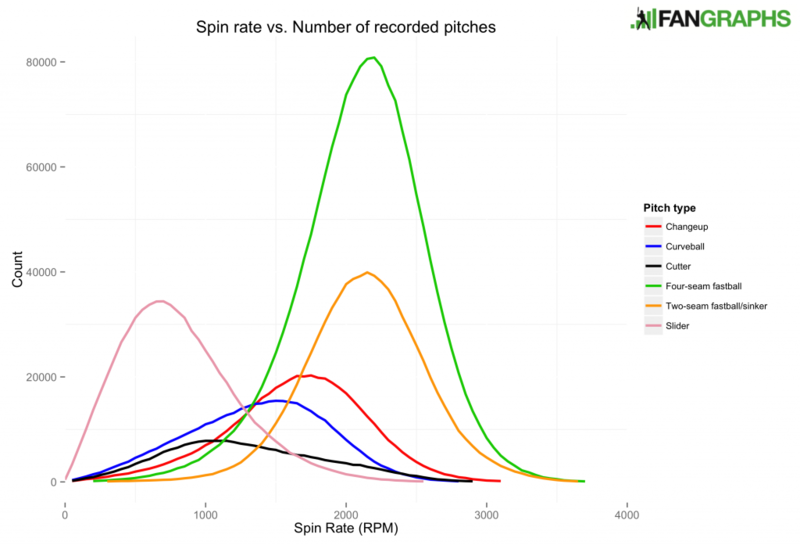 First, we’ll start out just with the number of pitches in the dataset at each spin rate for each pitch type. This should also give you a sense for the average spin rate based on the pitch. Fastballs spin the most (at slightly over 2000 RPM); sliders, the least (less than 1000 RPM). Other pitch types fall somewhere in between. Wait, this looks kind of weird. The average knuckleball spins about 800 times per minute? That’s over 13 times per second, faster than sliders. Something’s up here, and I don’t know what. It might just be best to take knuckleball data with a grain of salt. Each pitch but the curveball either stays roughly the same or sees a velocity increase as the spin rate goes up. This makes sense: curveballs are thrown with topspin, and other pitches are thrown with backspin, so a curveball with more spin will act differently than a non-curveball with more spin. 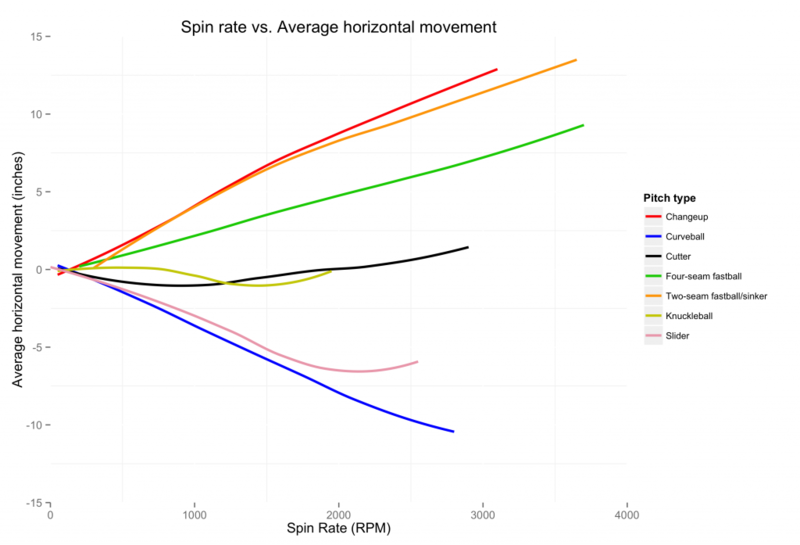 I’m not sure whether the increased spin is a result of the pitcher throwing harder for non-curveballs, or whether the increased spin causes the ball to move faster through the air, but either way there is some sort of correlation. How about movement? Horizontal movement in this graph is shown relative to the pitcher’s handedness, so the raw number in the PITCHf/x data is made negative for righties. A negative raw number is a pitch that runs towards the third base side of home plate, and a positive raw number is a pitch that runs towards the first base side. So adjusted the way it is here, a positive number indicates arm-side run and a negative number indicates glove-side run. These are both very clear. More spin leads to more arm-side run for changeups and two- and four-seam fastballs, doesn’t really affect the run of cutters and knuckleballs, and leads to more glove-side run for sliders and curveballs. More spin also leads to a higher vertical movement (which is really just less drop; the vertical movement is relative to a pitch without spin, not relative to what would happen without gravity) for two-seam, four-seam, and cut fastballs, as well as for knuckleballs (which, again, are questionable) and changeups; it doesn’t affect the vertical movement of sliders; and it makes curveballs drop much more. Once again, the topspin of curveballs makes it behave much differently than other pitches when thrown with more spin. It seems intuitive that a ball with more topspin would drop more, which is evidently the case. PITCHf/x measures the speed of the pitch both as the pitcher releases the ball from his hand and as it crosses the plate. The quantity represented in the graph is the average of the latter subtracted from the former. And sure enough, for every pitch (but knucklers), more spin makes the pitch slow down significantly more during its flight towards the batter. So, great. 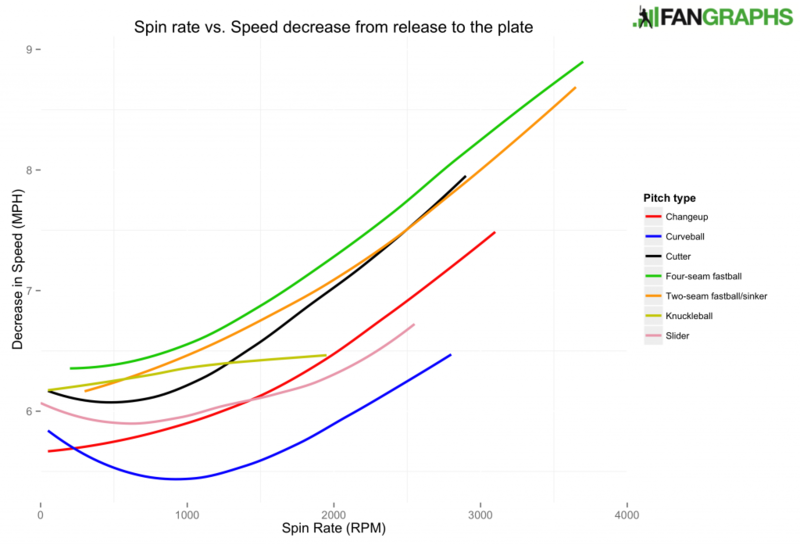 We know now what the spin of a baseball does to its flight, more or less, and we have cool graphical representations of that. But that’s not anything we couldn’t have explained with physics, and it doesn’t really help us know exactly how batters react to that or what effect a difference in spin makes in the result of the pitch itself. 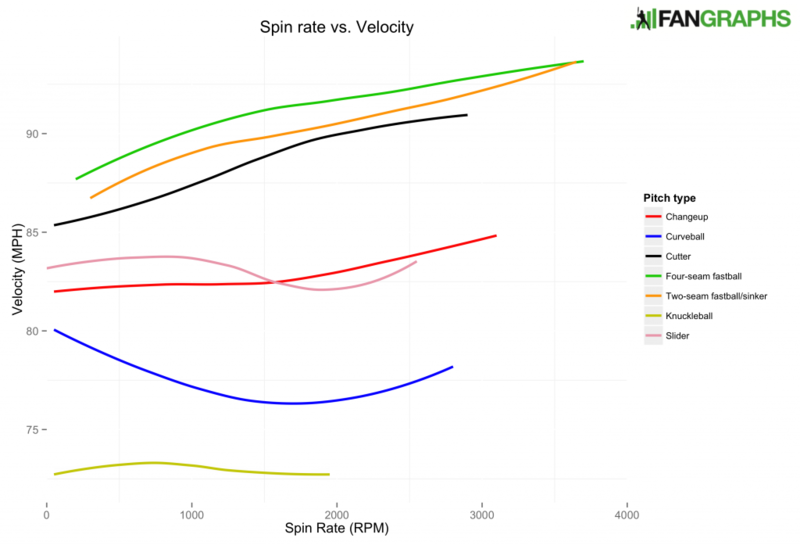 We can guess that more velocity is better for the pitcher, but then at the same time, the pitch slows down more with spin added — does those cancel each other out or is the effect compounded? 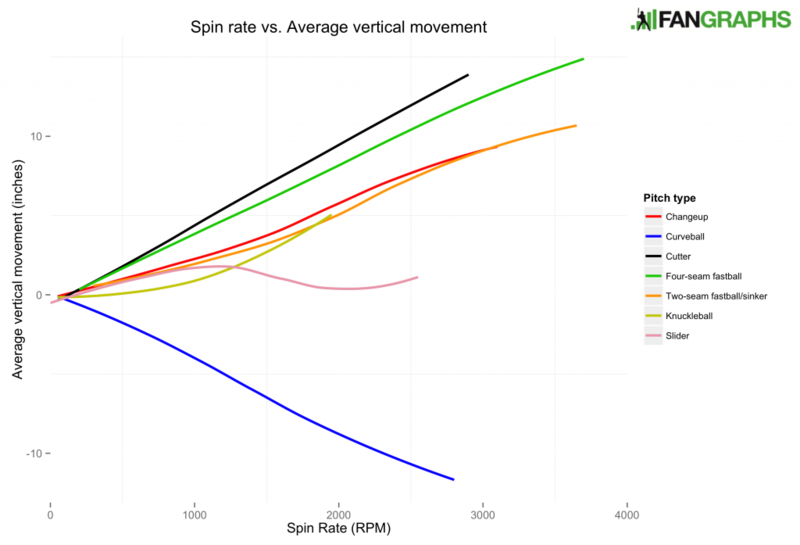 We know that the movement of different pitches changes with different amounts of spin, but does that make pitches more harder to control or harder to hit? We’ll answer those questions tomorrow with a look at how pitches with different amounts of spin are hit. We hoped you liked reading On Rotation, Part 1: The Effects of Spin on the Flight of a Pitch by Jonah Pemstein! The average knuckleball spins about 800 times per minute? That’s over 13 times per second, faster than sliders. Something’s up here, and I don’t know what. What’s up is that Pitch F/X doesn’t measure spin at all: what it does is measure the movement and infer the spin from that. 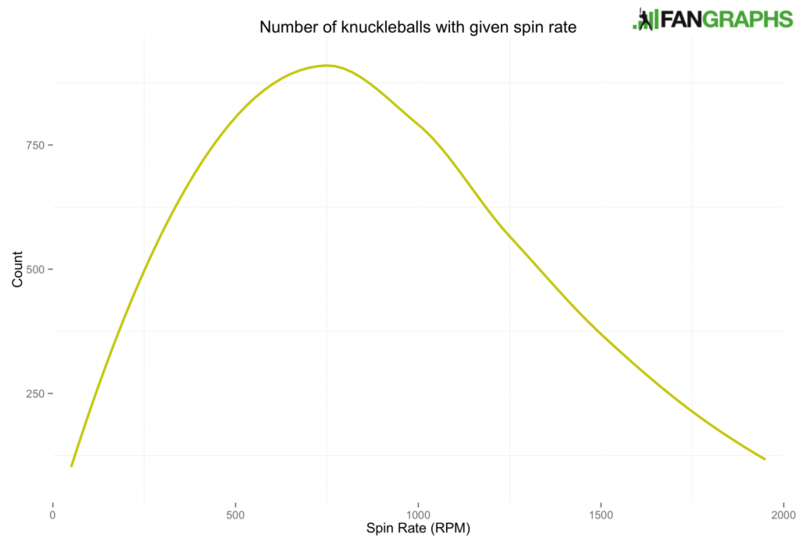 Knuckleballs move for reasons other than spin, but Pitch F/X sees that they move and interprets that as spin. Sliders don’t move as much because a lot of their spin is around the direction of movement, like a rifle bullet. That stabilises them rather than deflecting them, so Pitch F/X can’t “see” the spin. Hmm, did not know that. Thank you! Ah, I was going to post that about knuckleballs but was puzzled by the slider values, so thanks. So the slider spin values are ‘effective spin’, a hypothetical pitch with its spin scouts orthogonal to the flight of the ball. As opposed to the actual slider near-rifle spin, which is largely wasted for Magnus deflection.